When we raise our anchor we allow the windlass to pull it all the way through the rollers until it is very near to, or at a full stop. Then we attach a line to the chain and fasten it to a cleat at the windlass. We then let some chain out so that the weight of the anchor (75#) is being held by the cleat not the windlass. Others I know simply run the anchor all the way up until the windlass jerks to a stop and then leave it that way. What is the best way? What do you do? I do what you do and I do it because that is the best way. The other way you describe is warned against in the windlass instructions. In my case, I leave the line attached to the anchor and it goes up and down with the anchor. It's only about two feet long but it reaches a cleat when the anchor is in the storage position. I retract it fully, then give it a bump down to release the chain tension. I attach a Lewmar safety tether that prevents inadvertent deployment. I have a short piece of line with a snap shackle on one end. I loosen the tension on the windlass and hook the snap shackle to chain and cleat it off using the same cleat that I use when tying off anchor rode . I know I only have a manual windlass but this way I can leave the clutch loose to free fall and don't have to fumble around looking for the handle if I need to drop anchor fast . Nice and clean set up . I think what you are doing is the best way. Of course that is only because that is the way I do it. :-). I have a simply claw chain hook spliced onto a length of three strand. 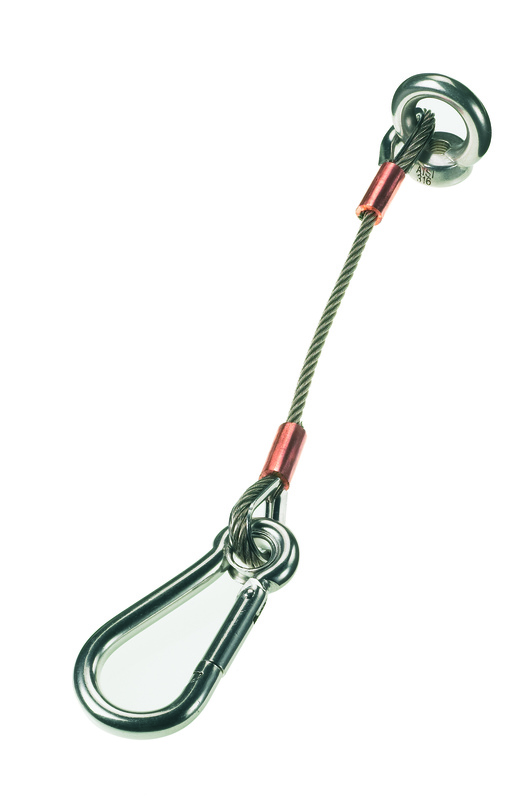 I occasionally use this as an anchor snubber when on a short term hook (such as lunch). I have considered just splicing an eye in the other end to drop over the cleat to keep it super clean. I think it is best to not have continuing tension on the windlass. I have a chain stopper that holds tension on the anchor and I can release tension on the windlass. Mine has adjustable clutches, so they slip when the anchor stops. Like everything tight in place, so no anchor movement when underway. A line to a cleat or a chain stopper ensures that the anchor doesn't deploy when underway. A clutch does not. I'm not sure what is 100% correct but I bring my anchor up until it is tight on the windless (the clutch slips at the end) then I have a SS turnbuckle attached to the deck which attaches to the chain and adds tension, and then I have a chain lock on the chain attached with a line that is slack just in case the clutch or turnbuckle let go. Don't you guys have pawls on your winlasses? You can fit aftermarket. ]not sure what a pawl is? I put a safety line on each chain as you have to disengage the clutch on the chain you're not deploying. Draw the anchors up tight with the winch, then put on the safety line. "What is the best way? What do you do?" "I have a chain stopper that holds tension on the anchor and I can release tension on the windlass." On a well found boat the chain stopper can take much more than the weight of the vessel. IDEAL sells them if the boat assembler didn't install one during the initial build.. I dont think either the sudden stoppage does much harm to a dc motor or teeth that are fully engaged all the time, especially if set so there is slipping of the clutch at some point. When I disassembled my 28 year old windlass that was heavily used before me and I know I torture tested it a few times, there was no wear or damage on the teeth. Same for keeping tension on it. Really no different than all those light weight winches out there that just use the motor and gearing to secure loads (not overhead loads as the winch should have a brake, but other loads are held just fine or they dlip with no damage). I pin my anchor, yes some say not the best method as it could bend the pin, and I deal with that......but pinning it requires some slack, so usually, I dont yank mine up tight as the pin secures everything just fine. I draw the anchor all the way until snug, then I attach a small safety line. Seems once again in boating, there is no "best way". I agree 100%. I only sercure my anchor with the turnbuckle as a precaution in case the clutch slips and the anchor self launches and wraps around the props and ruins my day. My manual suggests the last few feet be hauled manually...which actually puts as much force on tbe gears because of the long lever....but I never do that. The manual does not discuss briging ot al the way to a stop or storing it that way, just use the pawl on the chain gypsy so it cant drop accidently. My roller channel has a nice pin retainer so I use that. The last few feet are after the anchor has been lifted from the water which makes it appear heavier, no that no going to happen. When it comes to the windless or my back three quess who going to win.